Artisan detailing and expert craftsmanship make this two tone gold heart wedding ring from Apples of Gold an excellent fashion statement for any jewelry enthusiast. The inner ring is 14K white gold and extends to highly polished edges that give the band a smooth look. 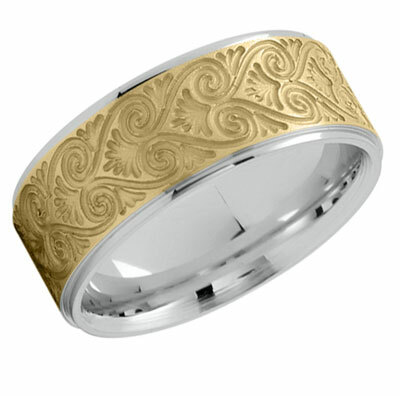 The detailed work is kept to the inside of the band, but fills the 14K yellow gold space beautifully. Fine lines arc into tight coils and outline heart shapes that encircle the band, the highlight to this charming ring. Band weighs between 10-13 grams (depending on size). We guarantee our Artisan Heart Etched Wedding Band 14K Two-Tone Gold to be high quality, authentic jewelry, as described above.